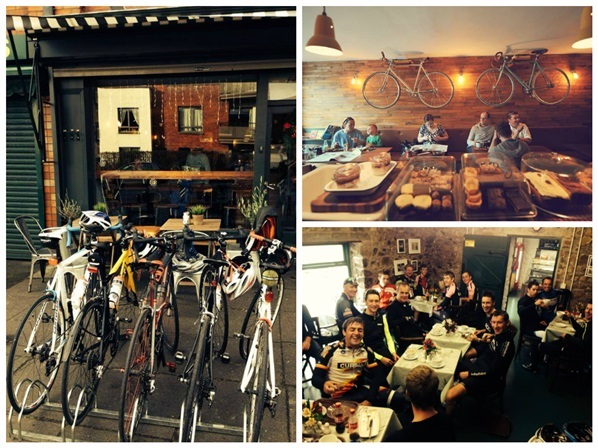 The Best Coffee Shops for Cyclists! A day out on the bike really isn’t complete without a good coffee stop thrown in for good measure! So that’s why CycleNI.com have put together a list of their favourite cafes and coffee shops all across the country, perfect for relaxing in and refuelling for your onward journey. 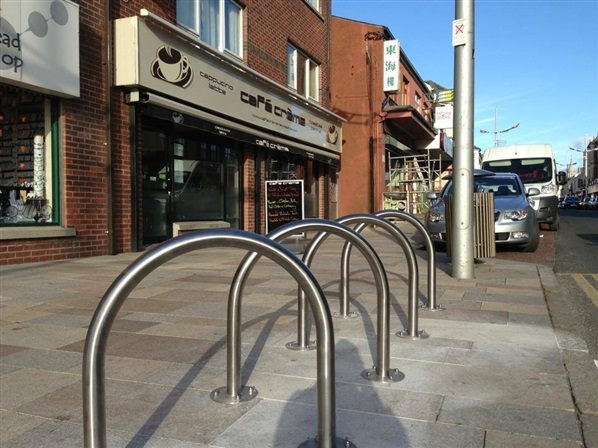 Some places mentioned below have bike parking outside and all of them are sure to give any cyclist a warm welcome! Inevitably there will be places to add to this list so if you know of somewhere that is not included and is cycle friendly please let us know by commenting below! 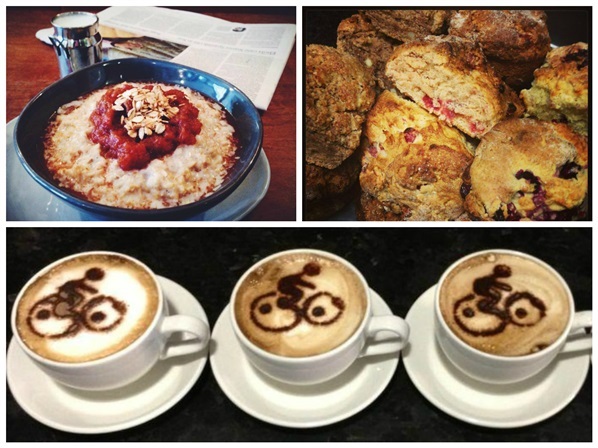 Divis Coffee Barn – the recently opened coffee barn at Divis has had many cyclists flock to it to sample the homemade baking and cooking delights and at 1,025 feet, it is Ireland’s highest coffee shop. The new Ridge Trail on Divis is open to cyclists and offers spectacular skyline views over Belfast. 5A Lockview Road – this cafe is a tiny, quirky little place that serves up great coffee and great food. Inside and outside you’ll notice the relaxed atmosphere around the place and another benefit is that it is ideally located on the edge of the Lagan and Lough Cycle Way in Stranmillis. Café Boyles, Ballycastle - is a family owned bistro based opposite the sea front in Ballycastle who pride themselves on sourcing local produce. The Ballycastle Cycle Route starts in Ballycastle or why not get the ferry over to Rathlin from Ballycastle and cycle across this beautiful Island. The Copper Kettle, Bushmills – the copper kettle is a great spot for a lunch break that serves everything from toasted sandwiches to soups to beautiful tray bakes. The Giant’s Causeway to Benone Cycle Route and the Ballycastle Cycle Route both pass through Bushmills. 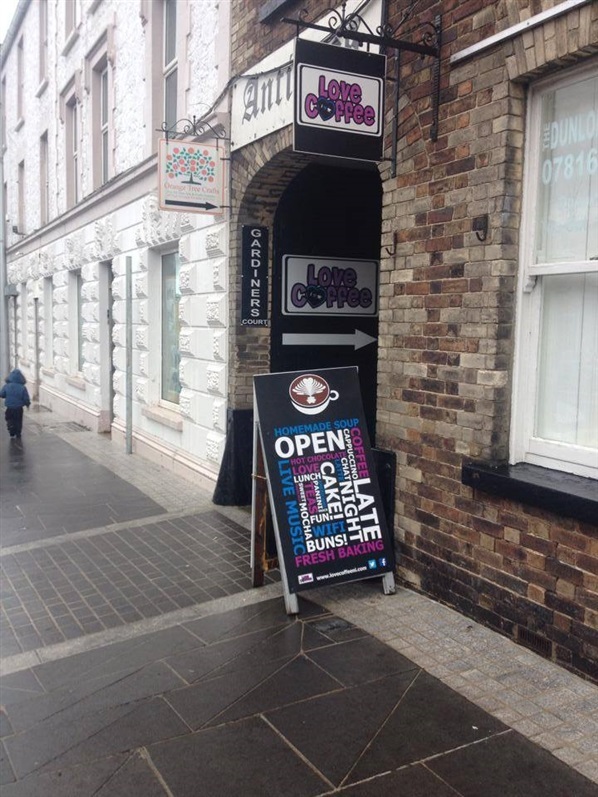 Love Coffee, Lurgan – is an ethical coffee shop specialising in artisan coffee, fair trade, homemade desserts and lunchtime treats. Cycle routes nearby include Oxford Island, Bann Montaighs Trails, Birches & Maghery Trails, Craigavon Cycle Trail, Craigavon Lakes Moutainbike Trail, Derrytrasna Loop and the Newry Canal Towpath. Studio Café at Wrights Soft Furnishings, Armagh – is a beautiful coffee shop full of homemade goodies, lunches and fair-trade tea and coffee. The Tassagh Cycle Route starts in Armagh or a short drive can take you to Gosford Forest Park where you can enjoy some off road riding. 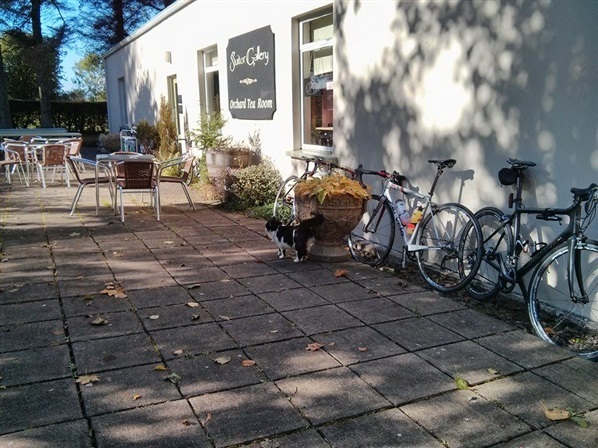 Scarva Tearooms, Scarva - the highly acclaimed tearooms are located adjacent to the Newry Canal Towpath and serve as a great place to relax or simply to enjoy the tranquillity of the canal side setting with a cup of coffee and a homemade scone or piece of cake. A new cycle hire facility is also now available on site. Café Crème, Newcastle – is a family run business offering good food with a friendly service in a modern and warm atmosphere. There are lots of cycling options either in Newcastle or close to it. Routes that either start or pass through Newcastle include the Mourne Foods Cycle Trail, Newcastle/Lough Island Reavy Route and the Newcastle Cycle Route. Routes nearby include the mountain bike trails at Castlewellan, the Dundrum Coastal Path, the Slieve Croob Cycle Route and the skills course at Tollymore. Loughshore Café at WWT Castle Espie, Comber - Castle Espie's Loughshore café offers a selection of delicious homemade food as well as speciality fairtrade coffees, teas and a range of soft drinks. The Strangford Lough Trail and the Whiterock and Mahee Island routes pass by the café and the Comber Greenway finishes in Comber which is 2.5miles from it. Crom Estate Tea House, Newtownbutler – this tea house is well worth stopping at for its delicious deserts and great bites to eat. The cycling route at Crom is perfect for families because it isn’t too long but offers spectacular views and places to stop off and see lots of interesting sights. Rebecca’s Café, Enniskillen - Rebecca's Café is located in the heart of the Buttermarket Craft Centre in Enniskillen and serves fresh homemade food. For longer distance cyclists the Kingfisher Trail, The West Fermanagh Loop and the North West Trail all pass through Enniskillen. More suited to families is the Castle to Castle cycle route which is 3 miles long and 90% of it is traffic free. A short drive will also take you to Castle Archdale where you can explore the off road trails in the forest. Ballymaclary House Tea Rooms, Limavady – this family run tea rooms offer light lunches, snacks and afternoon tea with a range of home baked delights, loose leafed teas and speciality coffees. The tea rooms are located just after the end of the Giant’s Causeway to Benone cycle route and a short drive to Castlerock (4.5 miles away) will bring you to the 2 mile Castlerock to Downhill Forest cycle route and the 13 mile Downhill to Magilligan Point cycle route. Ardmore Restaurant at Beechhill Country House Hotel, Drumahoe – is an award winning family-owned 18th century country house hotel situated in acres of picturesque woodland 2 miles from Derry City. Families will enjoy the short, off road cycling trails that have been developed in the grounds of the estate finished off with a visit to the Ardmore Restaurant to sample some of its many delights including their afternoon tea. Suitor Gallery & Coffee Shop, Ballygawley – is an idyllic retreat in which to have a break. Try their cinnamon scones and coffee, or browse the wide range of handmade jewellery, pottery, or collection of wooden toys and gifts. Cycle routes nearby include the Carleton Cycle Trail and the Carleton Trail Black Route. L’Artisan Café, Omagh - L’Artisan Café provides home-made scones, breads and tray bakes with a gluten-free range of foods. With winter here, stews and hot pots have also been added to the menu. The 5.5 mile Omagh Riverside Path to Gortnagarn cycle route starts in Omagh and is mostly off road. Whilst the following on road routes pass through Omagh - the North West Trail and Belfast to Ballyshannon. With the summer well and truly behind us and pumpkin season now just around the corner, we thought we'd suggest a weekend of Fireworks, Carnivals and Night Enduros in the North West of Northern Ireland this Halloween! 90 minutes drive from Belfast (3hrs from Dublin), Northern Ireland's second city Derry~Londonderry has re-branded itself as the 'City of Bones' this Halloween and is hosting a 17 day festival of night time markets, spectacular light shows, fireworks and Europe's largest street carnival. With the hugely popular Davagh Forest Trails located en route (1hr from Derry~Londonderry) Halloween is arguably the best time of the year to check out why the limelight is continuing to shine on this corner of Northern Ireland. Already famed for its cultural identity, Derry~Londonderry is raising the bar even further this year with an incredible programme of events genuinely catering for people from all walks of life. Just a quick glance through the city's extensive Halloween Events Listings will give you an idea of how much is being packed into this year's festival. Our pick of the bunch is Halloween night itself, Friday 31st October, which sees night time markets on Guildhall Street, the Awakening of the Walls (a theatrical show of light, fire, sculpture and circus), the City of Bones Street Carnival Parade and the always fabulous Halloween Fireworks Display over the banks of the River Foyle. If you're after a bit of luxury, check out Beech Hill Country House Hotel, four star accommodation just outside the city. On the Saturday morning, we suggest you enjoy Beech Hill's stunning surroundings on a easy going off-road cycling trail before heading down to Davagh Forest to check out the mountain bike trail centre that Singletrack Magazine reckon might just boast "...the best section of singletrack trail. Anywhere." Not bad praise from one of the sport’s most respected publications. Pop into nearby Cookstown for some early afternoon carb-loading before heading back to Davagh Forest to take part in much anticipated Davagh Enduro Night Rider. This event takes place from 5pm – 9pm on Saturday 1st November and is expected to attract riders from all over Ireland. 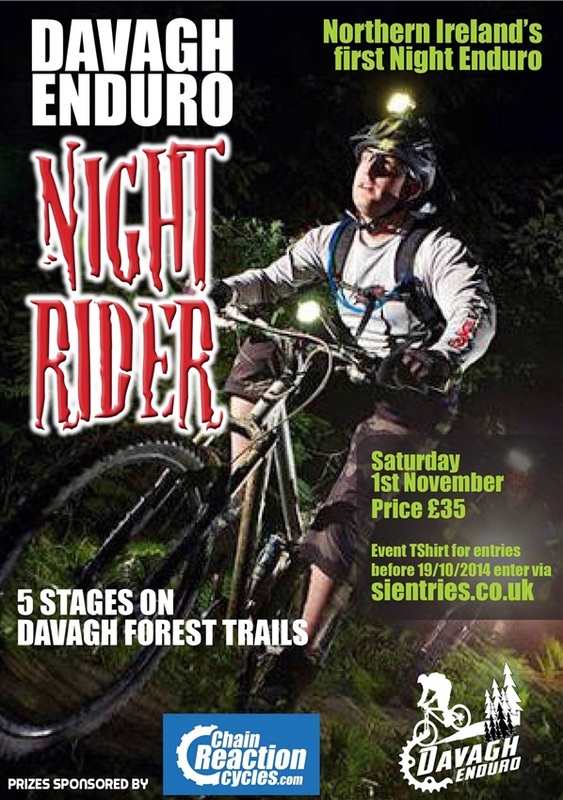 Catering for more intermediate to advanced mountain bikers with night riding experience, this unique enduro race will consist of five timed stages within the Davagh Forest Trails and can be taken as seriously or as light-hearted as you like! After all that adrenaline, you'll need a comfortable place to lay your head. Located just 6 miles from Davagh Forest, The Apparo is the perfect base for mountain bikers with modern accommodation and a MTB-Friendly restaurant which prides itself on using the freshest local produce. This is a great spot to relax and replenish all that spent energy from a long day out on the bikes. 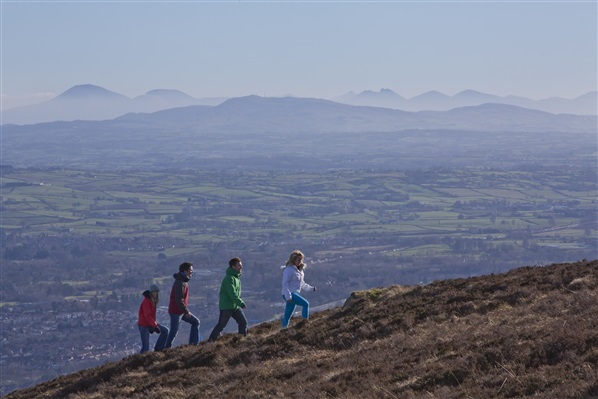 Depending on where you call home, you might consider splitting up your drive back on Sunday by checking out the new trails in Blessingbourne in Fivemiletown, Castlewellan or Rostrevor in the Mountains of Mourne. Enjoy the city and retreat to the countryside for some great walking all in the one weekend! Providing breath-taking views across the capital the Belfast Hills bring a unique sense of wilderness and escapism from the hustle and bustle of urban life below. Just a 2 hour drive from Dublin head up the Motorway or start your weekend with a relaxing train journey direct to Belfast, either way it won’t take long to get away from it all for the weekend. A striking visual boundary, just minutes from the city centre, fantastic views over Belfast and beyond can be easily enjoyed from the Belfast Hills. Divis (the highest of the hills), Black Mountain and Cave Hill all provide great vantage points to spot the iconic landmarks below including; The Samson and Goliath cranes, Titanic Belfast and the Stormont Parliament Buildings to name a few. There are also opportunities to cast your eyes further afield across Belfast Lough and as far away as the Isle of Man and Scotland. The hills are home to a wide range of wildlife and archaeological sites and have inspired writers and artists for centuries. Johnathan Swift was said to be inspired by the sight of Cave Hill leading him to pen his most famous work “Gulliver’s Travels”. One of Ireland’s most famous poets, Seamus Heaney used the hills as his muse and the area has also more recently been the setting for movies such as Hollywood blockbuster ‘Dracula: Untold’ and Oscar winning short film ‘The Shore’. At 478 metres (1,568ft) Divis is the highest point in the Belfast Hills. There are four walks to choose from at this National Trust owned site west of Belfast consisting of an expansive 2,000 acre mosaic of upland heath and blanket bog, home to a wealth of archaeological remains and wildlife. The 4.2 mile circular Divis Ridge trail is located in the Belfast Hills and offers spectacular skyline views over Belfast. Other views from the viewpoint include the Mourne Mountains, Scotland and the Isle of Man. Although situated high in the Belfast Hills the route is on relatively flat paths on tarmac, boardwalk and stone pitched gravel - designed to maintain the condition of the mountain slope. More serious walkers can walk a loop walk combining the Ridge Trail and Summit Trail which includes the summit of Divis and affords views to The Sperrins and North West Ireland. Other possible routes include the Heath Trail, a 4 mile route that traverses blanket bog, taking in the northern end of Divis and the Black Mountain site and the all ability 0.9 mile Lough Trail. Afterwards enjoy a cuppa or a sweet treat in the brand new Divis Coffee Barn. 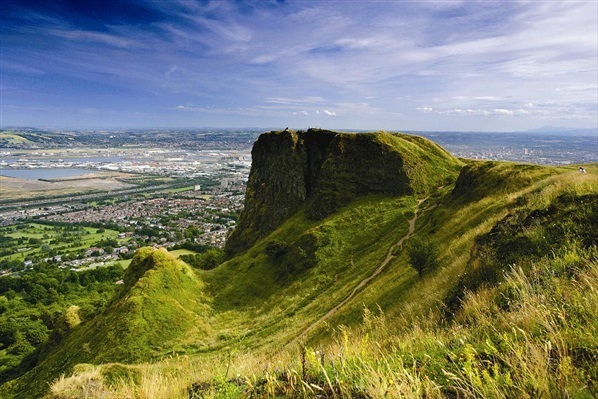 Just 9 miles from Divis, Cave Hill Country Park in the North of Belfast is home to the 12th Century Belfast Castle as well as fantastic walking trails up to the summit of the Basaltic Cave Hill. Starting in the carpark at Belfast Castle the walk follows a path uphill to McArts Fort, an Iron Age stronghold from which breathtaking views over Belfast can be enjoyed. An at times challenging route, over unsurfaced paths, with some steep sections you wont be disappointed once you reach the top where United Irishmen Theobald Wolfe Tone and Henry Joy McCracken once met in 1795 to take an oath to launch the rebellion of 1798. Afterwards enjoy afternoon tea or something more substantial at The Cellar Restaurant in Belfast Castle where traditional music can be heard most weekends in the adjoining bar. Less than 9 miles from the city centre there is plenty for walkers to explore once down from the hills. 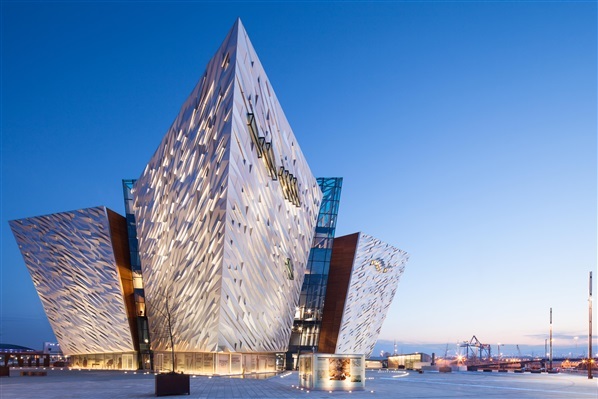 From the world famous Titanic Belfast to the Ulster Museum, Stormont Buildings and Queen’s University as well as countless restaurants, bars and shops. Check out Discover Northern Ireland for great accommodation deals in Belfast as well as information on everything you need to discover the city vibe during your next visit. The city centre offers some great urban walking too. From fascinating history to ghostly goings on there are lots of informative and interesting walking tours led by guides throughout the city. You can also explore the urban areas at your own pace with one of the many self guided walking tours taking in the history of Belfast, the tale of the Titanic and the hometown of world renowned footballer George Best. More details of these can be found in the WalkNI online Belfast Walking Guide. This 6.6 mile walk (one way) from Portrush to Bushmills via Portballintrae will definitely help you work up an appetite. Passing beach, cliff and castle there is plenty to admire along this coastal route which will take you along the sandy dunes of Whiterocks, a fabulous viewpoint towards Dunluce Castle and alongside the tracks of the Giant’s Causeway to Bushmill’s railway not to mention the jaw dropping coastal scenery along the way. Once you’ve reached Bushmills pay a visit to Ireland’s oldest working distillery and take in the sights and smells on a guided tour or simply enjoy the end product at the onsite restaurant and bar. Alternatively less than a mile away step back to a time steeped in charm at the luxurious Bushmills Inn. Roaring peat fires, nooks and crannies and a gas lit bar provide the perfect setting for a drink or two. Don’t miss out on the Traditional Irish music every sat night. A tranquil riverside route, this continuous flat off-road path links the two cities of Belfast and Lisburn. Starting from Stranmillis, just minutes from Belfast City Centre, the walk follows the river and late 18th century canal system through a variety of wetland, riverside meadows and mixed woodland. Your map readings skills don’t have to be great - just follow the water! Once in Lisburn, simply hop on the train back to Belfast. After walking the 11 miles from Belfast you will be greeted with the welcome sight of Hilden Brewery. A family run microbrewery take a tour or enjoy one of their many home brewed ales over a relaxed lunch or dinner in the Tap Room restaurant. This spectacular cliff walk follows a key section of the longer Causeway Coast Way & Ulster Way. Nearly 5 miles in length, the walk starts from the famous UNESCO world heritage site – the Giant’s Causeway. Along the way you will be greeted with some of the finest cliff scenery in Europe, with attractively named headlands and bays such as: Port na Spaniagh, The King & his nobles, Plaiskin Head, Hamiliton’s Seat, Benbane Head, Bengore Head, Portnabrock and culminating in the largest bay of Port Moon. Before you start pay a visit to the Causeway Hotel on the doorstep of the famous landmark. Built in 1836, the Taste of Ulster 2014 award winning hotel has a bar lounge ideal for a drink or light bite. For more substantial local fayre visit the hotel restaurant with stunning views across the bay to the Atlantic Ocean. Located on the southern shores of Belfast Lough, with two excellent beaches, spectacular scenery, a stunning waterfall and tranquil walks through wooded glens and along coastal path Crawfordsburn Country Park provides a relaxing natural retreat. Just a ten minute walk away sink into a comfortable chair by the fire or dine in elegance in the 1614 restaurant at The Old Inn, Crawfordsburn. 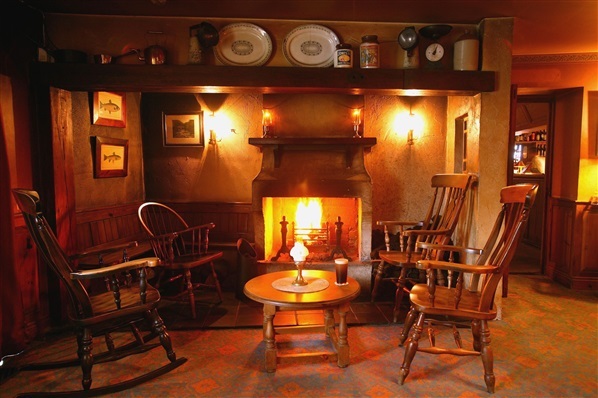 One of Ireland’s oldest hostelries the Old Inn has played host to many notable visitors under its thatched roof from famous author C S Lewis to former US President George W Bush. 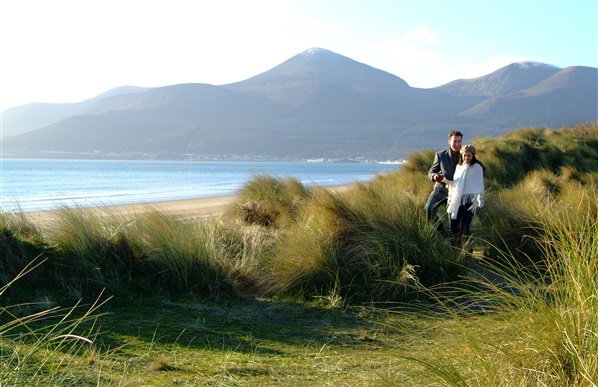 A fragile 6000 year old sand dune system owned by the National Trust and managed as Ireland’s first Nature Reserve since 1967, Murlough Nature Reserve is a fantastic 2.5 mile long walk with stunning views of the Mournes and Dundrum Castle. A short 5 minute drive away situated in the historic village of Dundrum, The Bucks Head Inn is sure to give you a warm welcome. This 18th century building has a cosy cherry panelled bar with an open fire conducive to casual intimate dining, as well as a new contemporary restaurant. Home to a twenty-one mile network of multi-use trails through the stunning 820 acre demesne there are no shortage of walks within Castle Ward. Situated on the shores of Strangford Lough take a stroll along the waters edge or head into the forest and explore the unique 18th century house or exotic sunken garden. Just 2 miles away in the picturesque village of Strangford the Cuan’s excellent food and drink await for walkers where strong emphasis is placed on using fresh ingredients and sourcing local produce. The Slieve Donard via Glen River (approx 6 mile) walk starts in Donard car park and climbs up through the forest to meet the famous Mourne Wall for the final steep ascent to the top. A total climb of 850m, the dramatic views of Newcastle and the sea below definitely make it worth the ascent. After climbing Northern Ireland’s highest peak the good news is you won’t have to go too far to find the perfect spot to rest your legs and enjoy a cold one. Situated 2 minutes walk from Donard car park Hugh McCanns is a fantastic spot to refuel and reminsence about your conquest. Just 2 miles from the bustling city of Derry-Londonderry you’ll find Beech Hill Country House Hotel where 3 miles of circular trails twist their way through the mixed woodland and landscaped gardens near the River Faughan, in the Faughan Valley. A nature lovers haven, the trails first appeared on the first edition ordnance survey maps (1830-1844) and in records from the mid 19th century. A hub of history, Beech Hill was used as a World War II camp by the US Marines who carved their names on a tree in the woods which can still be seen today. The trails start and finish at the front of the hotel where you can enjoy a meal in the Ardmore restaurant where the menu uses only the finest and freshest of ingredients mostly from nearby farms and local fishermen with vegetables and herbs grown in the hotel’s own walled garden. Alternatively relax and unwind whiling away the hours with a drink in the bar area. 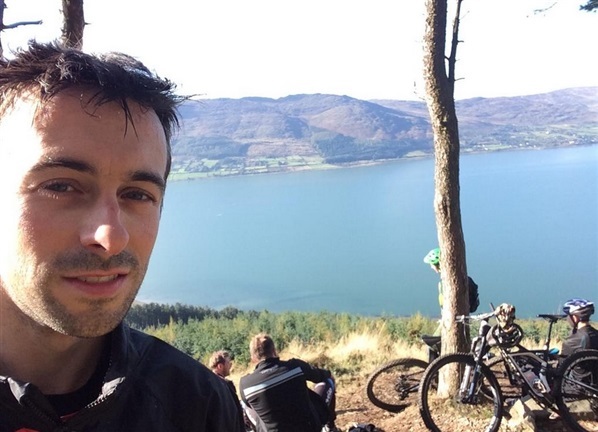 In case you missed it, the Rostrevor Mountain Bike Trails hosted World Superbike Championship rider Eugene Laverty last weekend. We thought we'd catch up with the Voltcom Crescent Suzuki man from Toomebridge to find out what he makes of Northern Ireland's new mountain bike trails. 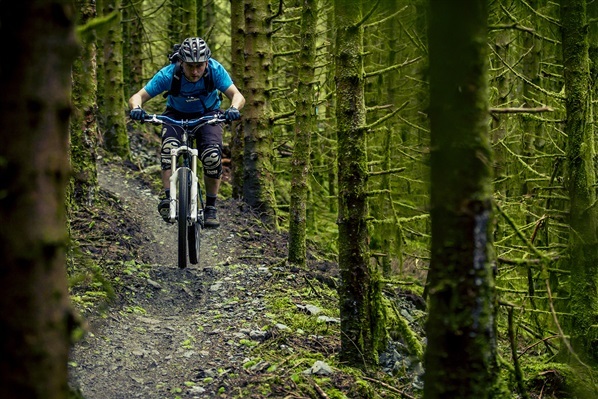 Was this your first time on the Rostrevor Trails? If so, what did you make of them? I love going mountainbiking with my friends whenever I get the chance to return to Northern Ireland. Davagh Forest is our local so I've ridden there quite a few time whereas this was only my second time at Rostrevor. I love the red route as the way back down is a great reward for the tough climb up to the top. How does Rostrevor compare to other places you’ve mountain biked before? In my eyes Northern Ireland is the best place in the world for mountainbiking. Strangely enough I don't get as much enjoyment when conditions are perfect as I find the trails more fun when they're a little slippery. More often than not the trails in Northern Ireland have some moisture on them which makes for much better riding conditions than dry, dusty trails. Should we expect to see you racing mountain bikes as well as superbikes in the future? I'm improving every time I ride but my friends will assure you that I'm no aspiring pro MTB'er! I find it good for my sport because it's a great workout going both up and down hill. You need to keep your wits about you on the fast downhill sections and so it's good to keep my mind alert between races. I firmly believe that riding a bike of any sort, be it with an engine or without, helps to develop my bike handling skills.